Here is a glimpse of the various solutions that Killark can provide. See the Killark Solutions. Try out some Killark Resources. Killark XCS SERIES CONTROL STATION Control Stations provide control solutions in hazardous location areas to supply; START/STOP Motor Functions, LED Pilot Light Indications and more. Utilized in Class 1 Division 1 & 2, Class 1 Zone 1 & 2 areas for indoor use are a Non-Factory Sealed unit requiring the need for a conduit seal fitting. UL Listed and CSA Certified. Copper free cast aluminum alloy. Ground flange joint between bolted cover and box provide required flame path. Push button, selector switches and pilot light operator bodies are copper-free aluminum. 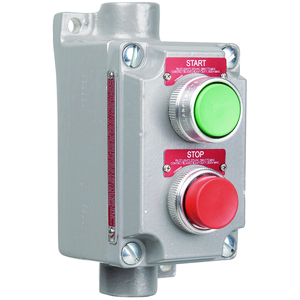 Operating shaft in both push buttons and selector switches are stainless steel. Killark is a proud member of the Hubbell family.